Today is the first day of my CSA (community sponsored agriculture). For anyone not familiar with the term, it is an arrangement where you join (for lack of a better word) or buy shares from a farm early in the year then during the summer you get free produce from that farm. It works for the farmers who get funds to buy seeds, equipment, pay employees and for the members, fresh vegetables (usually organic) at reasonable prices. My farm is called Roxbury Farm, they are in New York State and have been operating for twenty something years. Each week during the summer I get a newsletter and on Thursdays I pick up the produce at a local church (I’ll take pictures soon). The amount of produce is very generous and I have friends who share my share with me. So what you see here is really only 1/3 of a share – since it is early in the summer, lettuce and greens make up a majority of the share. Look for lots of recipes using my CSA produce. 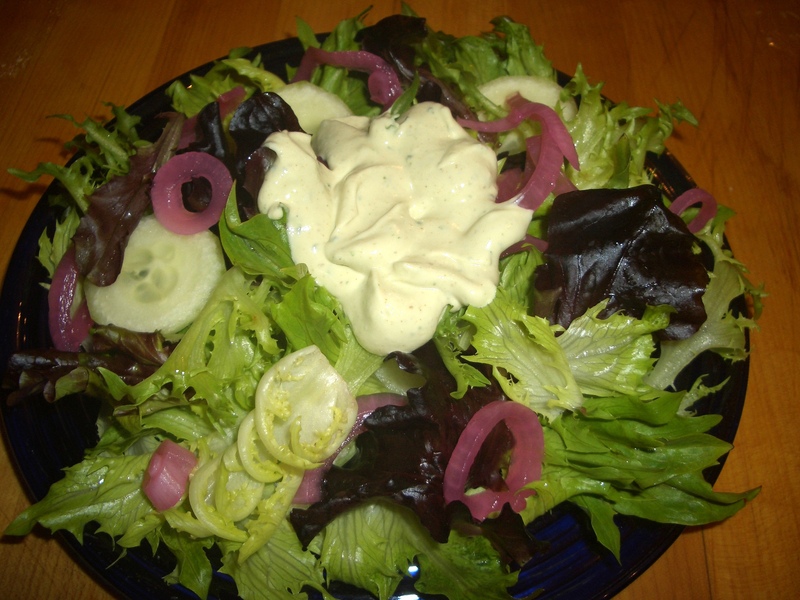 On Tuesday I promised you a use for pickled onions – here is one: add it to salads to add texture, color and a contrasting flavor. This is just the first of many times you will see them here. Tahini is the name of a product made of ground sesame seeds (and sometimes oil) and is similar to, but thinner than, almond butter. You can find it in any store that sells Middle Eastern products or in any health food store. It’s also available in some supermarkets. Like almond butter, it will separate into solids on the bottom with oil on the top. Stir vigorously until the mixture is smooth and without lumps before using in recipes. 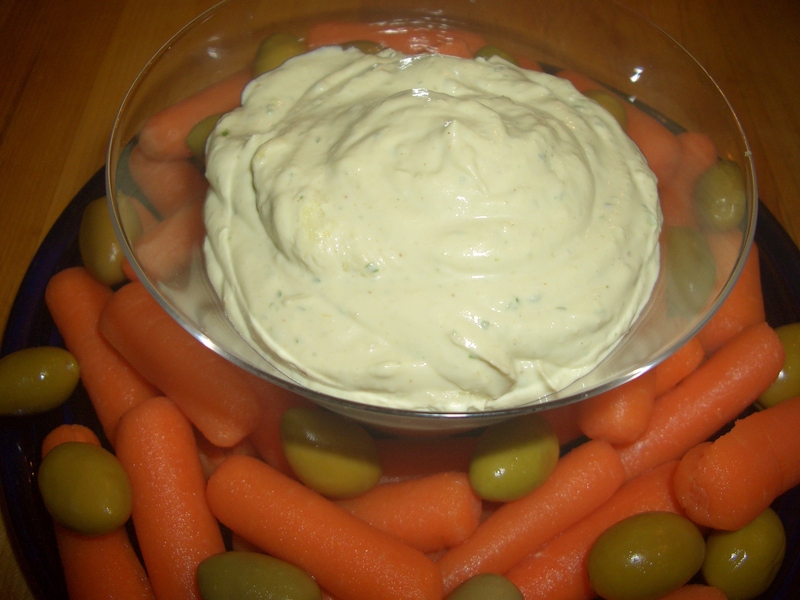 The name tahini is also used to describe a dip/dressing made with tahini plus lemon juice, garlic, water, and other seasonings. I always associate tahini with hummos or falafel because that’s how I first encountered it on a trip to Israel – about a million years ago. Now when I have it in my refrigerator I find lots of other things to do with it, especially since going dairy free. It has a creaminess that is somewhat like sour cream. 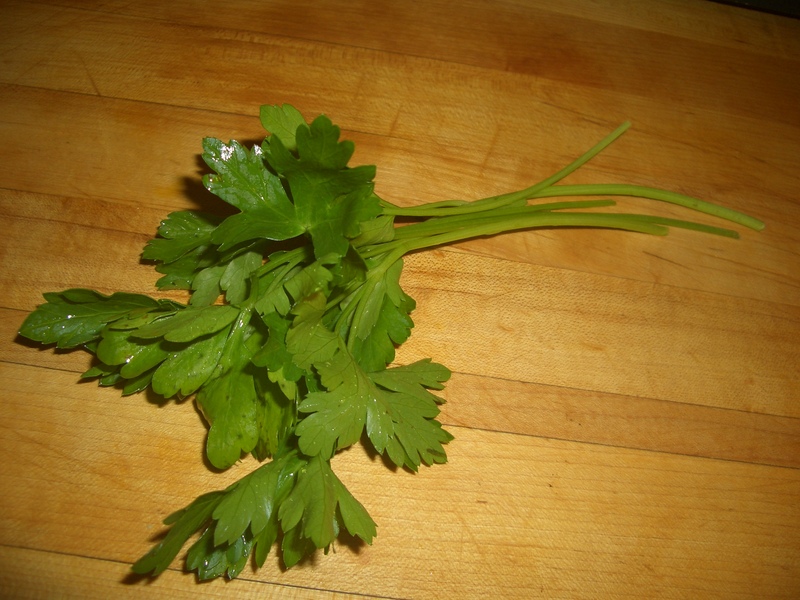 I serve it as a dip with crudities; a sauce with lamb burgers or shish kebobs; and as a dressing for salads. If I were a really ambitious blogger I would also give you a recipe for your own homemade tahini; but since I’m not that ambitious I will simply refer you to sites where you can get the recipe: http://thesimpleveganista.blogspot.com/2012/10/homemade-tahini.html, http://www.food.com/recipe/homemade-tahini-73859, http://www.yumsugar.com/Homemade-Tahini-Recipe-25190494. The first site uses only sesame seeds, the other two use oil in addition to the sesame seeds. Having never made it myself, I can’t advise you on that. Having eaten it I can assure it is yummy. 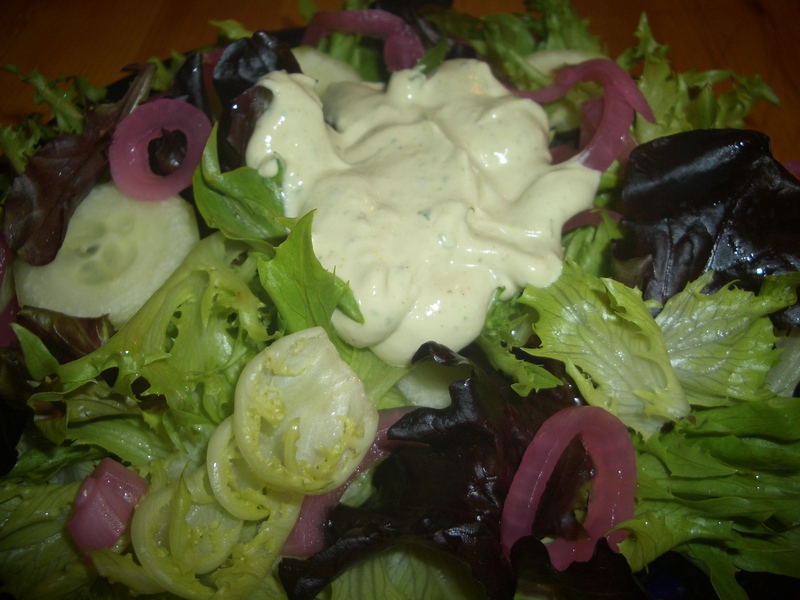 Tahini (the dressing) can range from very thin (like buttermilk) to very thick. How thin you make it depends on how you intend to use it. On falafel balls it is pretty thin (like french dressing), when serving it with hummos it is thicker. 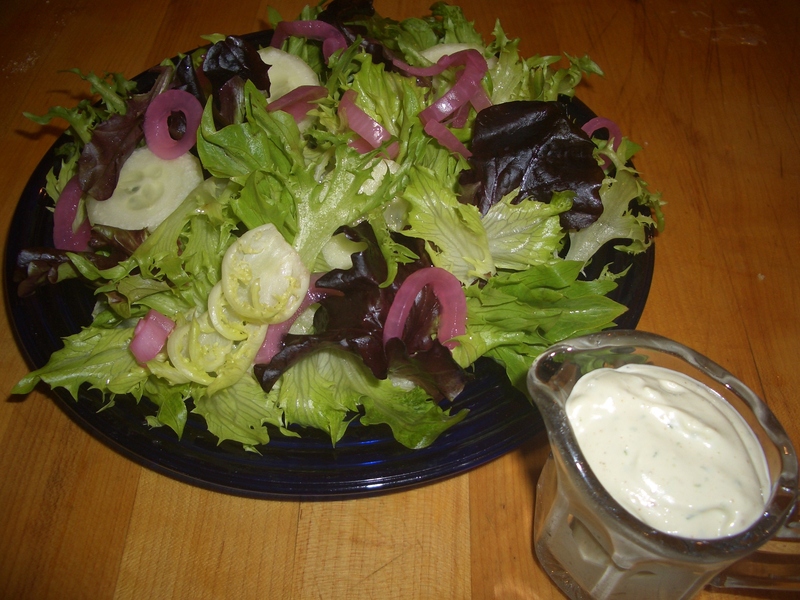 For salads I like the “blue cheese dressing” consistency, but you might prefer it thinner. All you have to do to achieve your desired consistency is to add water. 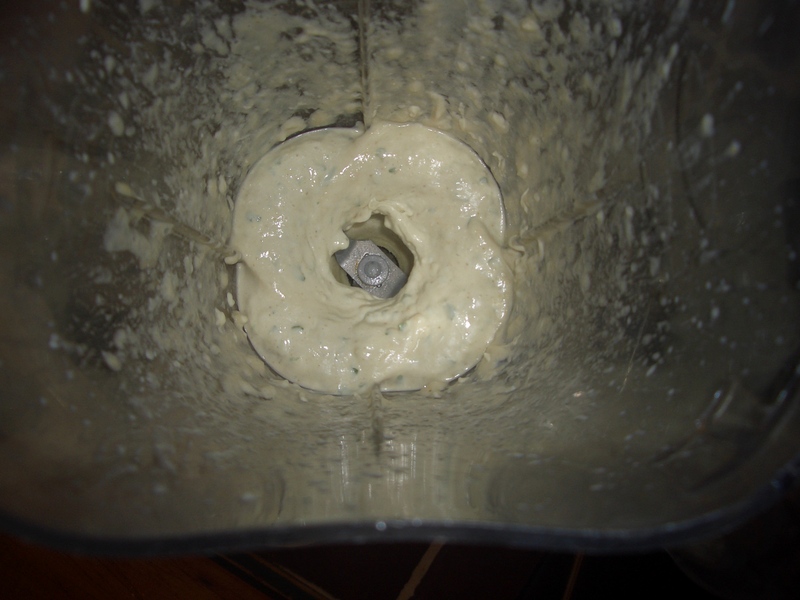 Tahini thickens upon standing, so expect to add water each time you use it. The recipe yields a pretty thick version of tahini, tailor it to your taste. 1. 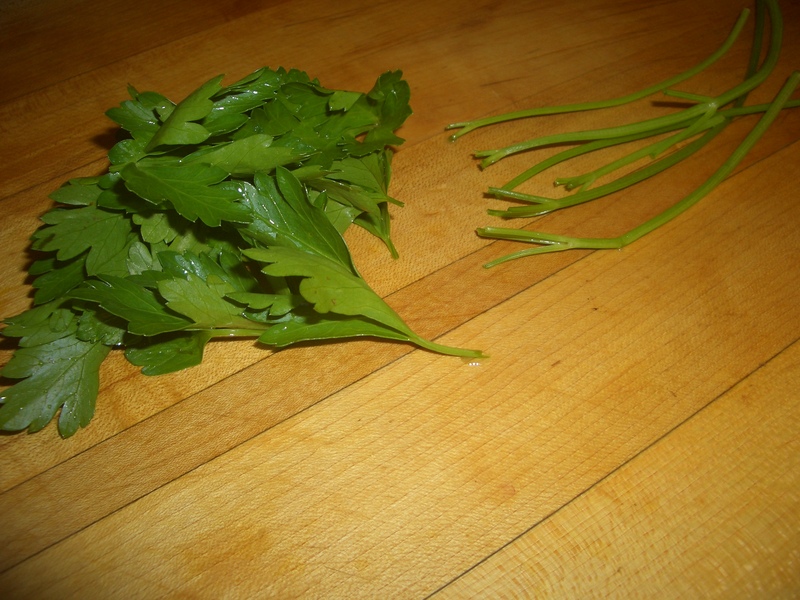 Remove the thick stems from the parsley sprigs (the photo shows six but I only used 3). 2. 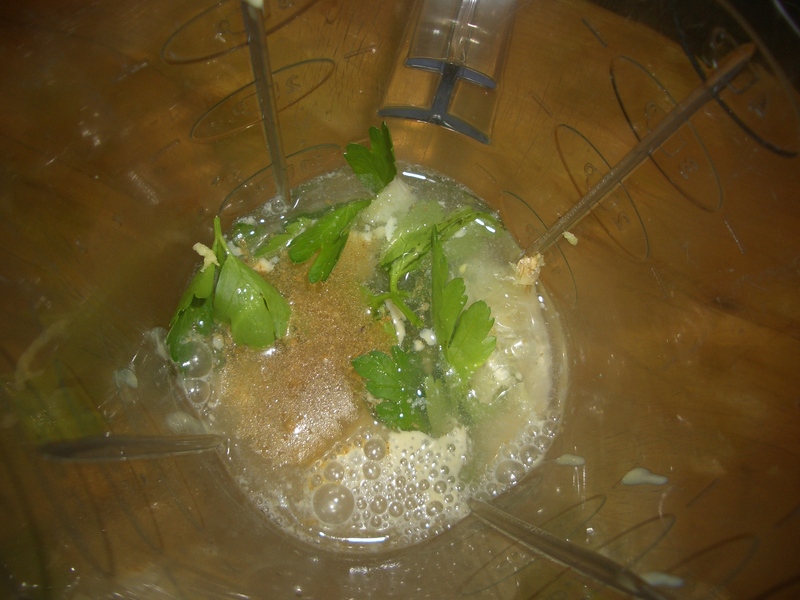 Place all ingredients into a blender or food processor container.